Durham County Council alongside Manchester City Council was one of the year one pilot areas for Dementia Friendly Swimming. The ASA’s national project launch was held at Chester-Le-Street Leisure Centre in County Durham in February 2015. Dementia Friendly Swimming links in extremely well with other work taking place in County Durham to create dementia friendly communities as part of the County Durham and Darlington Dementia Strategy. Since the launch of the project, weekly sessions have been developed at two of the county’s pools with plans to roll out to all six pools managed by Durham County Council by the end of 2016. The sessions are currently being delivered at Chester-Le-Street Leisure Centre and Teesdale Leisure Centre (Barnard Castle), with specially trained staff to support those people living with dementia. They have received lots of positive feedback from individuals who have attended, particularly around how much they enjoyed the swimming experience and how friendly pool staff were, with customer’s commenting on how well looked after they felt while in the leisure centre. To increase usage, Durham County Council is planning on taking a different approach in 2016. As well as maintaining the weekly group sessions, they will try to give customers living with dementia additional support to attend public swimming sessions at other times by linking in with volunteering schemes in the county. The Step Inside training has been well received. By the end of 2015 68 members of staff had been trained across five pools with further training planned for 2016. 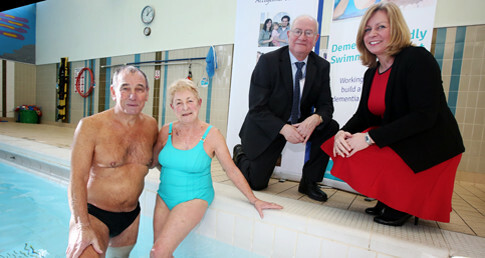 Councillor Simon Henig, Leader of Durham County Council, said: “We are delighted to be supporting the ASA’s Dementia Friendly Swimming Project.